cat eyes & skinny jeans: Last Day! 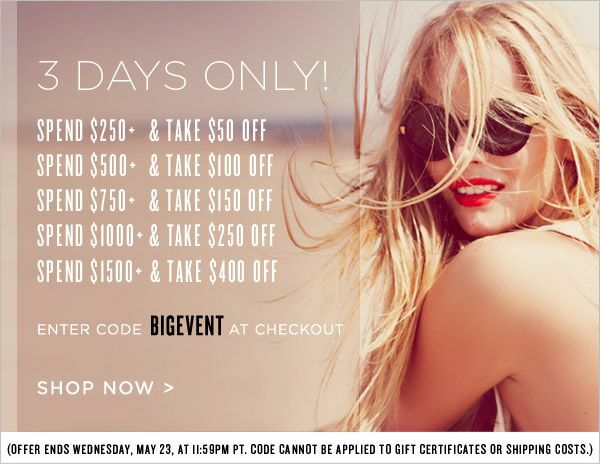 Spend to Save at Shopbop! Seasons have changed, which means that a few wardrobe additions are most definitely necessary; and Shopbop is making it simple for you to save money, while you spend! 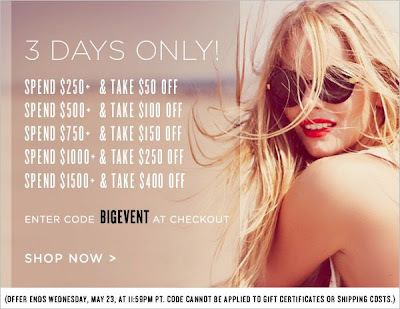 Through 11:59pm PST tonight (Wednesday, May 23, 2012), simply enter code BIGEVENT during checkout to save anywhere from $50.00 to $400.00 on purchases. The more you spend, the more you save; so splurge on that 10 Crosby Derek Lam Dress you’ve been crushing on; snag that beautiful Bec & Bridge Mini you simply can’t get off your mind; add a Dauphines of New York Headband to your accessory collection; take home a summer-perfect dress from Patterson J. Kincaid; or scoop up a charming Whiting & Davis Clutch. Don’t worry…it’ll be our secret. I love the purple romper.